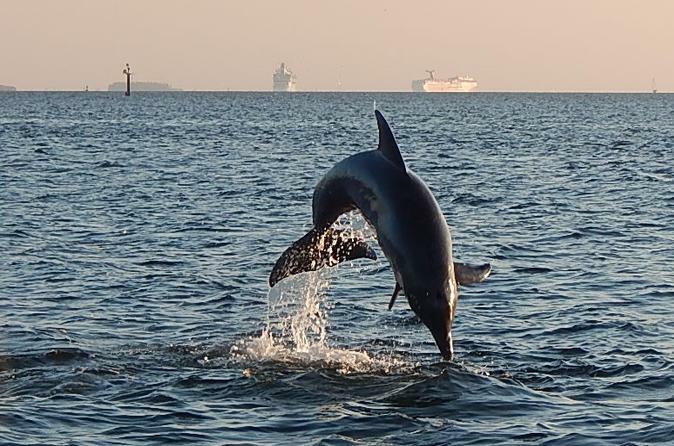 After boarding your cruise, you'll travel out in the bay to see pods of friendly Atlantic Bottle-nose dolphins. Your captain will bring you to areas where these dolphins spend their day feeding, playing and raising there young. Just outside Tampa's downtown is the nursery for Tampa Bay's dolphin population where mothers and calves frolic the day away. Your guide will explain the daily life and habits of the dolphin on this 1.5-hour cruise. When your guides spot the pods of dolphins, the boat will stop within 30 feet (10 meters) or less as the guides have ways to get them to come right to the boats. Keep your cameras ready as you will see dolphins closer than you ever thought. You will be a master of dolphin spotting by the end of your cruise! After seeing the dolphins you'll head back to to downtown Tampa, cruising the channels and river and learning about the great city of Tampa.